Engagement rings are a major expense for all men. When a man finds the woman of his dreams and is ready to propose, he can plan on spending several thousand dollars for a nice diamond to seal the deal. These 10 engagement rings, however, cost insane amounts that only the incredibly rich can possibly afford, which probably explains why all of the rings on this list were purchased by celebrities, royalty, or other members of the top 1%. Made with some of the finest diamonds on earth and set in precious metals, these engagement rings are the envy of all brides-to-be. Unfortunately, most men will never be able to afford a ring that’s a tenth of the price of any of these blingin’ beauties. Ok, so the cost of this engagement ring is not amongst the highest of all time, but its value certainly is. Let me explain. This engagement ring was originally commissioned for Princess Diana by her husband, Prince Charles of Wales, in 1981. At the time, the ring “only” cost Charles $45,000. These days, the ring is worn by Charles’ son William’s wife, Kate Middleton. With inflation, the ring is currently valued around $300,000, but should it ever become available for sale (which it almost certainly will not), this ring would fetch well over $1 million. 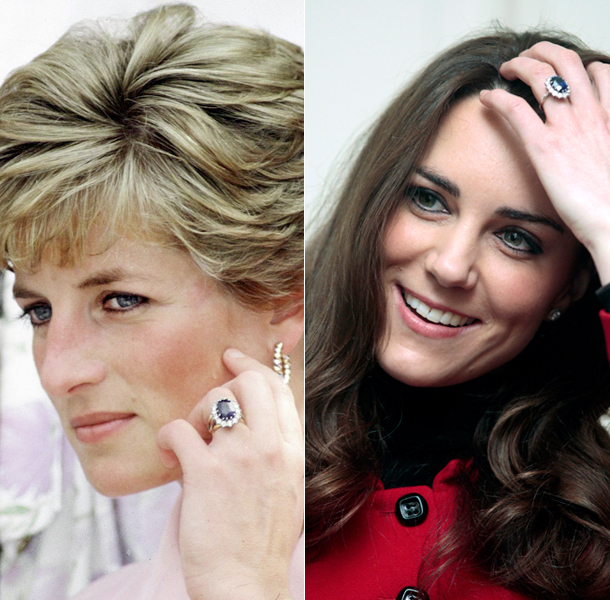 This is one of the most famous rings ever, thanks in part to Princess Diana’s tragic, premature death. A ring worn by royalty, with so much historical value, would certainly be amongst the most expensive all time if it were to be sold at auction.